TwinScrew has dedicated all her power to R&D, manufacturing, and marketing of PVC parallel counter-rotating twin screw extruder since first established in 1988. To this end, we have set up a professional team with abundant and proficient talents who specialize in the area of PVC screw design. Through the diversity and capability of our human resources and technical knowledge, TwinScrew has earned complete trust and confidence from our customers. We invest to all categories of advanced equipment without a second thought for the good of creating outstanding and perfect machines. The import of WALDRICH COBURG from Germany is an excellent support of how serious we care about the precision and efficiency which is contributed to the adoption of CNC Milling & Drilling machine and automatic CNC programing. More specific examples are like Thyssen Henschel high torque gearbox unit for its long-standing guarantee of reliability and performance. TwinScrew control all technical procedures from R&D, design, manufacturing, finishing, to service. These fine products come from our home-made core unit and all the sophisticated equipment. 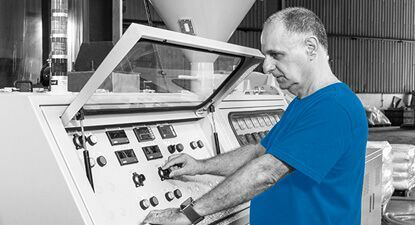 We help our customers solving their essential problems by providing professional and flexible total solution more than just a twin-screw extruder. Our professionalism has extended from PVC into profile extrusion and foaming area. It is able to produce varieties of construction materials including doors, windows, gutters, shutters, wall panels, decorative trims, and etc. TwinScrew is not satisfied with being the professional manufacture of PVC twin screw extruder, we also dedicate to R&D and marketing. With perfect reputation of our machines, TwinScrew equals to the guarantee of quality and the presentative of twin screw extruders. Your reliance and confidence has motivated us to keep going and improving. Our Service Technology innovation, perfect service, and internationalization are always our core values, with this mission we have become the pioneer of twin screw extrusion in the global market and a reliable partner of our customers. TwinScrew will never stop progressing in the field of PVC extrusion and twin screw extrusion; we will no doubt lead the twin screw technology into an ultimate and great attainment.